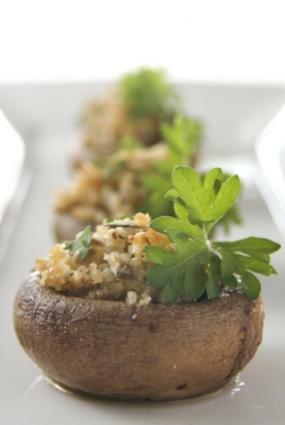 Stuffed mushrooms make a wonderful appetizer and can even fill in as a main course. At their best, stuffed mushrooms are savory and delicious. However, if you don't prepare them properly, they can be slimy and tasteless. With the right prep work, recipe and mushroom selection, you'll have tasty, well-made stuffed mushrooms every time. It's important to choose mushrooms that are large enough to accommodate stuffing without being so huge that they move beyond bite-sized. Mushrooms shrink during cooking, so you should select large, white button mushrooms or crimini mushrooms. Crimini mushrooms will add a hearty, almost meaty mushroom flavor, while white button mushrooms tend to have a more mild flavor. After you have selected appropriately-sized mushrooms, you need to prepare them before you stuff. Use a mushroom brush or paper towel and gently remove any debris. Never wash or submerge mushrooms. The fungus acts like a small sponge, soaking up as much liquid as it can. If you wash or submerge your mushrooms, they will become mushy and watery. Remove the entire stem of the mushroom and make room for a little additional filling by using a melon baller to further hollow out the mushroom if needed. Pre-brown your mushrooms on a lightly oiled baking sheet at 350F in the oven. Mushrooms should be hollowed-side up. Brown them for five to eight minutes, until the mushrooms begin to release their liquid. When they are slightly brown, remove them from the oven and cool. Once they are cool you can use a paper towel to remove any extra liquid. Make sure you properly prepare your stuffed mushrooms for optimum results. This classic recipe combines breadcrumbs, hard Italian cheese and herbs. Mix bread crumbs, cheese, garlic, herbs and salt and pepper. Oil the baking pan with a small amount of the olive oil. Drizzle with remaining olive oil. Bake for 25 minutes, until the filling is golden brown. Made with either supermarket pesto or your favorite pesto recipe, these stuffed mushrooms are loaded with fresh herbal flavors. Brush a small amount of olive oil on a baking sheet. Mix together bread crumbs, ricotta, pesto and mozzarella. Fill mushroom caps with filling. 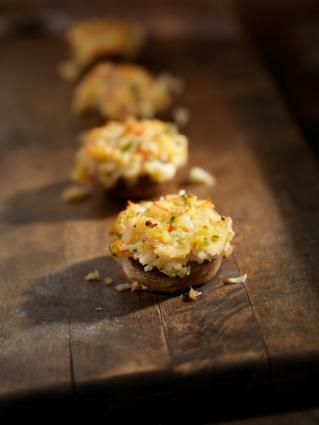 Whether you make these stuffed mushrooms with crab, or include other shellfish like lobster and shrimp, seafood mushrooms are a favorite at parties. Lightly grease a baking sheet with olive oil or nonstick cooking spray. Blend cream cheese, egg yolk, 1 tablespoon bread crumbs, scallion, garlic, lemon juice, Worcestershire sauce, salt and pepper until well-combined. Stuff mushrooms with filling, and top with the remaining cup of bread crumbs. Bake for 12 to 15 minutes, then broil to brown the bread crumbs. These savory mushrooms have the delicious flavor of Italian sausage. Crumble sausage into a sauté pan and cook about four minutes. In a food processor, combine garlic, mushroom stems, celery, onion, pepper and spinach. Pulse six or seven times to chop. Add vegetables to the pan and sauté for another four to five minutes. Remove from heat. Add bread and cheese to pan and toss until bread moistens. Bake for 6 to 8 minutes, until stuffing sets. Consider the following for successful mushrooms. Err on the side of dry stuffing. Even with pre-browning, the mushrooms will release additional moisture. A drier stuffing will soak up the excess. Don't skip the pre-browning process, or your mushrooms will wind up mushy. Mix cheese into fillings instead of sprinkling on top. If you want an extra brown topping, sprinkle with bread crumbs and broil for a few minutes. Enjoy the mushrooms with Champagne or a nice Pinot Noir. 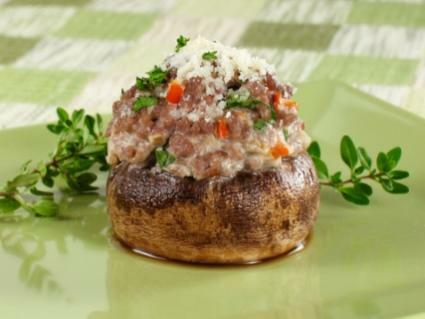 Stuffed mushrooms are always a popular appetizer; turn them into a main dish by adding a salad and crusty bread. With knowledge of the right cooking techniques and some basic recipes, begin to branch out and make substitutions to create your own stuffed mushroom masterpieces.